Miami Beach is a coastal city located on a series of natural and man-made barrier islands. There are two main towns within Miami Beach: South Beach and North Beach, which are famous for much more than their fabulous beaches. 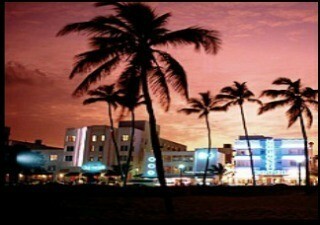 South Beach is known worldwide for its dining, shopping, recreation, entertainment, and art. The Beach is full of life and excitement day and night as you spend the day enjoying the beach and then switch over to the club and lounge setting in the evening. During the day you can relax on the beach, take a bike ride along Lincoln Road, explore the many museums, or engage in some retail therapy. The city comes alive at night with countless restaurants, clubs, and lounges that give Miami Beach its thrilling and energetic reputation. There is something for everyone in Miami Beach. Miami Beach is comprised of hundreds of luxurious hotels, condos, apartments, and office space that are either Mediterranean inspired or extremely modern with an Art Deco flair. Convenience is key and Miami Beach has perfected the ease of getting around. The Miami Dade Transit and Metrobus lines can take you to the Metrorail, which can then take you anywhere in South Florida. Miami International Airport is nearby and easily accessible by shuttle bus. There are many elementary schools in the area for younger children and one public middle and high school. The sophisticated and exciting city has so much to offer its residents and visitors. Make other people jealous by telling them that you live in Miami Beach.